Angry Robot books have yet to disappoint me. 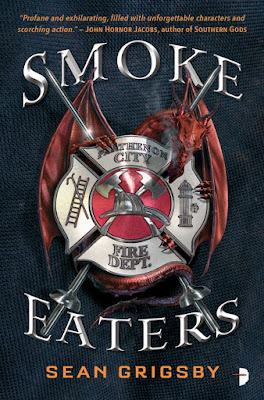 The same goes for Smoke Eaters by Sean Grigsby - a new twist on the urban fantasy genre, with a highly original take on the dragon mythos paired up with some pulsating action sequences, terrific humour all headlined by this grizzled veteran fire-fighter dude with balls of steel. This is high-class entertainment and a book that truly deserves all the accolades pouring in for being such a wicked good fun read. So 22nd century America is as you would imagine it. A dystopian piss-bowl with high levels of environmental degradation and a poor place to live in by any standards. America is now split up into different independent sovereign city-states. Technological advances are slick and aid life. The only problem is, dragons are no longer part of the fairy tale -They are real, ugly scaled, fire-breathing monster having clawed their way up from the core of the earth and are now having a whale of a time above-ground, shooting fire-balls and being a general menace to the living society. Enter Cole Brannigan, fire-services captain on the brink of retirement after having gloriously served his society - all ready to just drop the ball, stay at home with a loving wife and his robo-dog and enjoy life. But of course life has other plans in store. As the story opens, in a freak dragon-attack that was supposed to be regular fire hazard, he loses one of his team members before the Smoke-Eaters, the officially appointed force to contain and minimize losses from such dragon attacks, can save the scene. He also realizes that he's got this rare ability to breathe smoke and stay alive, that pretty much qualifies him as a SmokeEater. He doesn't really have much of a choice - and he's pretty much press-ganged into joining forces with this 'Elite' squad, relegated to being a rookie, in his grey years - His unshakeable sense of duty coupled with his die-hard cynical view of the society doesn't really do him much good in the Smoke Eaters' division. Captain Jendal (Mixed origins - Indian! ), Afro (Sort of a Maori origin rugby player from the Kiwis!) and Afro-American Sergeant Puck who loves making her recruits do push-ups make up the close team for Cole as he tries to blend in, unsuccessfully mostly in this mad-hatter's dream team. What follows through, is of course Cole learning the ropes, stumbling through life and also uncovering a large conspiracy that threatens his whole world. This book is just super fun - Cole's cynicism is thinly veiled and injects a rich vein of humour to the unbelievable circumstances that he's thrust into. He is chiefly the reason I raced through the narrative [ Well, it helps that the book is paced like a rocket-fuelled jet plane] - Tough as nails bringing his vast experience as a fire-fighter to the front as we battle crazy mad-house dragons out to chew up and spit-roast anything in their sights. The narrative does follow a standard cop drama of a rookie, trying to cut his teeth in on the proceedings. But Cole's the kind of rookie who's not afraid to break rules and thus win hearts. His deeply caring nature, built over years of brotherhood fighting to tame fire, helps him through and his character really was the shining light of the whole book for me. 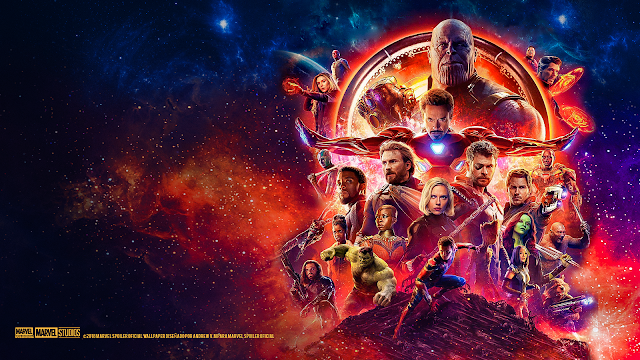 The world-building borders on the unbelievable sometimes but there are elements worth crooning - the laser toys, the mecha-suits, the dragons, all of it in a semi-post apocalyptic America and this seems to loosely work together. I am not complaining though as I totally loved the premise. 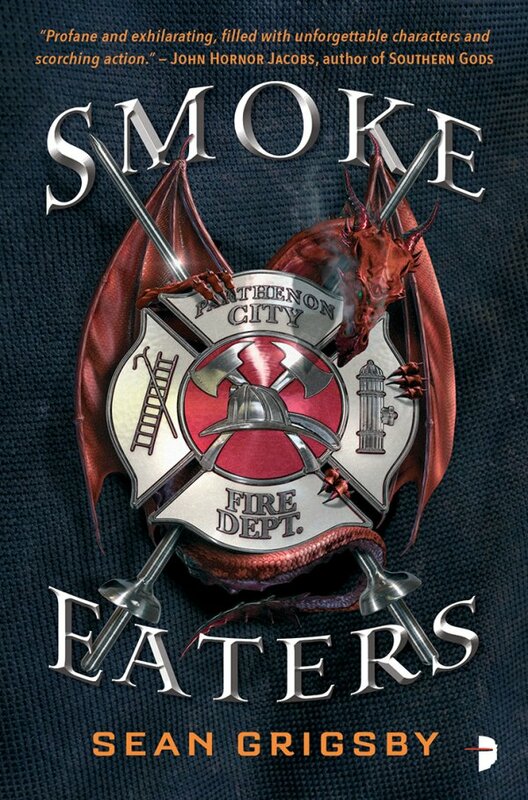 Truly a scorching hot debut packed with pulse-pounding action and a hero, you can't but love, Smoke Eaters is the sort of book you should be reading on a dark cloudy day - Trust me, you don't need more sunshine than this. 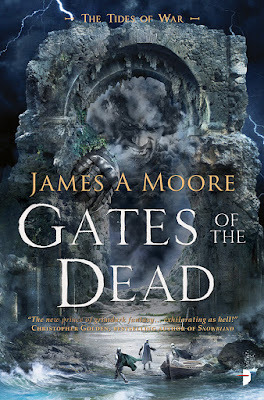 This absolute fire-blast of a book is a shot in the arm for urban fantasy genre.